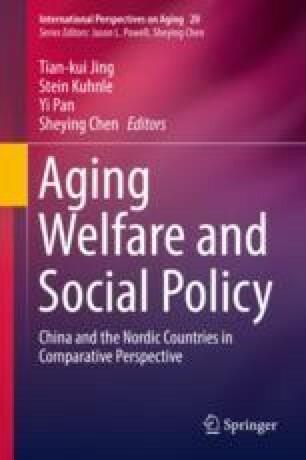 This chapter will focus on care services for the elderly, an increasingly important part of the future welfare state, in light of the demographic transformation towards an ageing society. It will address what challenges are identified by governments and key policy actors in Norway. What policy ideas and responses have been developed? What could be relevant from these experiences when developing services for the elderly in other countries? The Scandinavian countries have all engaged in policy innovations in order to consolidate sustainable welfare states, including care solutions for a growing elderly population. New policy ideas associated with the concepts of active and healthy ageing have also made their imprints within elderly care through the concept of ‘active care’, representing new ways of defining the content and quality of care. Another important dimension concerns the ‘welfare mix’ referring to the relative role of the main institutions of society, family, state, market and the voluntary sector, in providing resources and delivering care. A hallmark of the Scandinavian countries in that respect has been the relatively strong role of the public sector in financing and delivering care services. However, as part of an ongoing debate on future care services there are voices arguing for a changed welfare mix in care in which increasing responsibility is given to the three other institutions. A third dimension of innovations concerns the use of ‘care technology’ to enable elderly people to live more independent lives and to assist care workers in their work tasks. Høyskolen i Bergen. (2015). Vossamodellen–hverdagsrehabilitering. Retrieved April 18, 2015, from http://www.hib.no/forskning/om-forskning/ahs/vossamodellen/. Norges Bank. (2015). Valutakurser. Retrieved April 9, 2015, from Norges Bank http://www.norges-bank.no/Statistikk/Valutakurser/valuta/CNY/. Norwegian Ministry of Health and Care Services. (2014). Egenbetaling for kommunale tjenester i og utenfor institusjon. Oslo: Helse-og omsorgsdepartmentet. Retrieved from https://www.regjeringen.no/nb/tema/helse-og-omsorg/helse%2D%2Dog-omsorgstjenester-i-kommunene/innsikt/egenbetaling-i-og-utenfor-institusjon/id434597/. OECD. (2015). Database on social expenditure. Paris: OECD. Retrieved 22 April, 2015, from https://stats.oecd.org/Index.aspx?DataSetCode=SOCX_AGG.